Topology meets superconductivity through innovative reverse-order sample preparation. (L-R) Professor of Physics James Eckstein, his graduate student Yang Bai, and Professor of Physics Tai-Chang Chiang pose in front of the atomic layer by layer molecular beam epitaxy system used to grow the topological insulator thin-film samples for this study, in the Eckstein laboratory at the University of Illinois. 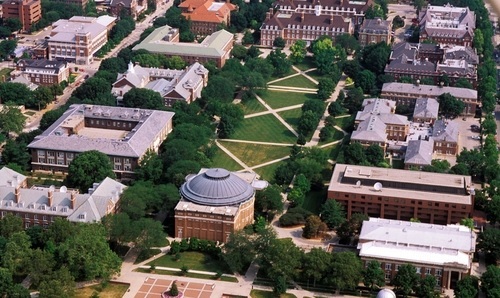 Photo by L. Brian Stauffer, University of Illinois at Urbana-Champaign. A groundbreaking sample preparation technique has enabled researchers at the University of Illinois at Urbana-Champaign and the University of Tokyo to perform the most controlled and sensitive study to date of a topological insulator (TI) closely coupled to a superconductor (SC). The scientists observed the superconducting proximity effect—induced superconductivity in the TI due to its proximity to the SC—and measured its relationship to temperature and the thickness of the TI. TIs with induced superconductivity are of paramount interest to physicists because they have the potential to host exotic physical phenomena, including the elusive Majorana fermion—an elementary particle theorized to be its own antiparticle—and to exhibit supersymmetry—a phenomenon reaching beyond the standard model that would shed light on many outstanding problems in physics. Superconducting TIs also hold tremendous promise for technological applications, including topological quantum computation and spintronics. Naturally occurring topological superconductors are rare, and those that have been investigated have exhibited extremely small superconducting gaps and very low transition temperatures, limiting their usefulness for uncovering the interesting physical properties and behaviors that have been theorized. TIs have been used in engineering superconducting topological superconductors (TI/SC), by growing TIs on a superconducting substrate. Since their experimental discovery in 2007, TIs have intrigued condensed matter physicists, and a flurry of theoretical and experimental research taking place around the globe has explored the quantum-mechanical properties of this extraordinary class of materials. These 2D and 3D materials are insulating in their bulk, but conduct electricity on their edges or outer surfaces via special surface electronic states which are topologically protected, meaning they can’t be easily destroyed by impurities or imperfections in the material. But engineering such TI/SC systems via growing TI thin films on superconducting substrates has also proven challenging, given several obstacles, including lattice structure mismatch, chemical reactions and structural defects at the interface, and other as-yet poorly understood factors. The �flip-chip� cleavage-based sample preparation: (A) A photo and a schematic diagram of assembled Bi2Se3(0001)/Nb sample structure before cleavage. (B) Same sample structure after cleavage exposing a �fresh� surface of the Bi2Se3 film with a pre-determined thickness. Image courtesy of James Eckstein and Tai-Chang-Chiang, U. of I. Department of Physics and Frederick Seitz Materials Research Laboratory. The method allows for very precise control over sample thickness, and the scientists looked at a range of 3 to 10 TI layers, with 5 atomic layers per TI layer. The team’s measurements showed that the proximity effect induces superconductivity into both the bulk states and the topological surface states of the TI films. Chiang stresses, what they saw gives new insights into superconducting pairing of the spin-polarized topological surface states. Chiang credits Eckstein with developing the ingenious sample preparation method. It involves assembling the sample in reverse order, on top of a sacrificial substrate of aluminum oxide, commonly known as the mineral sapphire. The scientists are able to control the specific number of layers of TI crystals grown, each of quintuple atomic thickness. Then a polycrystalline superconducting layer of niobium is sputter-deposited on top of the TI film. The sample is then flipped over and the sacrificial layer that had served as the substrate is dislodged by striking a “cleavage pin.” The layers are cleaved precisely at the interface of the TI and aluminum oxide. 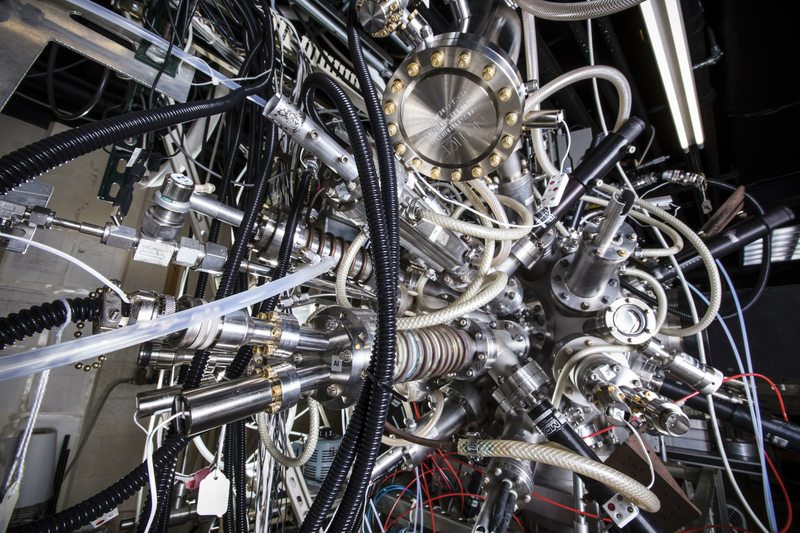 A close-up shot of the atomic layer by layer molecular beam epitaxy system used to grow the topological insulator thin-film samples for this study, located in the Eckstein laboratory at the University of Illinois. 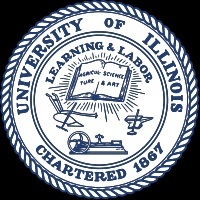 Photo by L. Brian Stauffer, University of Illinois at Urbana-Champaign. The cleavage was performed in an ultrahigh vacuum, within a highly sensitive instrument at the Institute for Solid State Physics at the University of Tokyo capable of angle-resolved photoemission spectroscopy (ARPES) at a range of temperatures. “This new sample preparation method opens up many new avenues in research, in terms of exotic physics, and, in the long term, in terms of possible useful applications—potentially even including building a better superconductor. It will allow preparation of samples using a wide range of other TIs and SCs. It could also be useful in miniaturization of electronic devices, and in spintronic computing, which would require less energy in terms of heat dissipation,” Chiang concludes. These findings were published online on 27 April 2018 in the journal Science Advances.